Garry Craig Powell: I don’t think it’s affected creative writing courses enough. They have a responsibility to be absolutely honest with students, who often do begin their courses thinking that the degree will give them an excellent chance of getting a publishing deal—which as you know, is far from the case. In fact no one in the publishing world cares what your academic background is, as far as I can tell. Perhaps that’s untrue if you’ve gone to Iowa, but I doubt it. RM: Do the courses aim to equip students for a writing career or prepare them for the world of publishing? GCP: Creative writing courses often do claim that they prepare students for a career, yes. At UCA, according to the department’s website, ‘The Arkansas Writer’s MFA Workshop is a writing-intensive studio program in Creative Writing that uniquely prepares graduates for careers in writing pedagogy and publishing.‘ That involves compulsory courses in pedagogy, and opportunities to work on an online magazine. As far as I know, no UCA graduates have yet managed to land a full-time job in teaching creative writing or publishing, although a few have got part-time editorial positions, in one or two cases with quite prestigious poetry presses. But in most cases it would be quite unrealistic to assume that an MFA degree is going to get you a job with Random House or Penguin, or a tenure-track teaching job. RM: Social media and blogging tools have brought us a world where the author is now able to build an identity and following independently of a publisher. Has the teaching of creative writing adapted to this? GCP: Ah, the much-debated ‘platform’. Some programmes, UCA among them, certainly do encourage that, and even teach courses on it. I have mixed feelings about that. On the one hand, as you say, undeniably some people—a very small minority—do manage to create a following independently of a publisher. But I suspect that has more to do with personality than skill. Nearly every writer I know has some kind of ‘platform’, but that generally doesn’t translate to more than a few hundred followers, of whom perhaps a few dozen regularly read your posts. So how helpful is that? With rare exceptions, the books you hear about are still the ones in the bookshops, which have got there because a major publisher has put them there. It’s not the only way to do it, as you know, and young writers should be taught how to promote their work—which in any case they’ll be expected to do even if they land a contract with a major publisher. But I sometimes feel it’s putting the cart before the horse. If you haven’t written anything yet, what’s the point of having a polished, glamorous platform? What are you going to promote? You’ve got to do the hard work of writing some good books first. RM: I don’t disagree. Although it takes time to build a platform, I believe it takes a lot longer to build a sound and reliable set of critical and writing skills. Okay – a big question arising from this: how has self-publishing affected graduate creative writing courses? GCP: I don’t think it has. There’s a lot of snobbery. In the academic world, a self-published book is quite worthless, so the professors don’t do it (with rare exceptions) and they don’t usually encourage their students to, either. I don’t recommend self-publishing unless you already have a very solid platform. People I know who’ve done it, even if they had good books, had very disappointing sales. RM: But there’s more to it than sales. Sometimes self-publishing is the only way a writer can make a start. All literary agents have books they fiercely believe in but can’t get deals for because of the commercial climate. 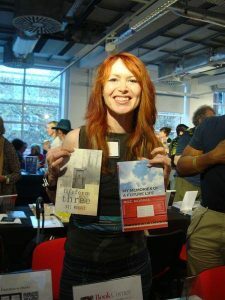 At one point, agents in London were talking about helping these writers to self-publish. I think the ethical considerations proved too thorny, but they appreciated that a lot of talent was getting away. GCP: I’m sure you’re right about that. I just wonder if it’s worth self-publishing if no one gets to read the book, or hardly anyone. Perhaps it is. As with small presses, sometimes getting the book in print can lead to getting read and reviewed, even if sales are low. I don’t mean to suggest that self-publishing is a bad idea. It might be a good start for some people. I’m just saying it hasn’t worked for people in my circle. RM: So the general perception of self-publishing in the world of the university creative writing teacher is…? GCP: It’s perceived as inferior, frankly. The idea is that a good book ought to be able to find a respectable traditional publisher. As you know, that’s not always the case. I think the academy is out of date on this. RM: Anybody here knows I could talk about this one point till the sacred cows come home – so we’d better end it there for today. Thanks again, Garry. Next time we’ll look at the dual roles of writing and teaching – and how this is sometimes a tricky balance. Some courses include modules on platform and promotion – if this is important to you, check the curriculum.